Hi! My name is Courtney Monroe and I am from Hot Coffee, Mississippi. I am nine years old. I was born without my right ear and my right kidney. I was diagnosed with a form of Goldenhaar Syndrome when I was one month old. I always knew that my ear was different from everyone else’s, but I never let that stop me from just being me. Hi! My name is Courtney Monroe and I am from Hot Coffee, Mississippi. I am nine years old. 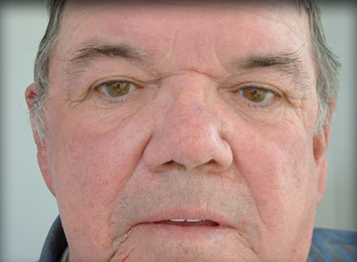 I was born without my right ear and my right kidney. I was diagnosed with a form of Goldenhaar Syndrome when I was one month old. I always knew that my ear was different from everyone else’s, but I never let that stop me from just being me. One day, when I was eight years old, I was eating lunch with my mom and grandmother and I told them that I wanted an ear. My mom and my grandmother said okay and started trying to find out how to get one. My mom took me to Dr. Carron at the University of Mississippi Medical Center in Jackson, Mississippi. It is through him that I met Mrs. Allison, who designed my ear… and the rest is history! The whole process to obtain my prosthetic took about six months. I had surgery in December and in June, after my posts had time to osseointegrate, I was able to finally get my ear. My ear is great! Mrs. Allison even pierced it for me! When I wear it no one ever notices that it is a prosthetic. It looks real, even my mom forgets that it is a prosthetic. It is really comfortable to wear and I don’t even feel it at all. It really stays on well too. I cheer for my schools youth association football team and I wore it to every game. I also take tap, ballet and jazz dance classes. I always wear my ear to dance practice. I love my ear and I never want to be without it. On February 15, 2004, I was in an automobile with my cousin. I was the passenger and had fallen asleep at the time the driver lost control of the vehicle. The accident happened in East Texas where I had been attending two funerals on the day before. I was thrown out of the vehicle through some small trees and one of the limbs snatched my right ear off. On February 15, 2004, I was in an automobile with my cousin. I was the passenger and had fallen asleep at the time the driver lost control of the vehicle. The accident happened in East Texas where I had been attending two funerals on the day before. I was thrown out of the vehicle through some small trees and one of the limbs snatched my right ear off. I was transported to a local hospital which is not advanced enough to do that type of surgery. Therefore, I ended up being transported on a second journey to Tyler, Texas. They brought a doctor in to do a surgery that would involve re-attachment of my ear. The surgery went okay, but when the ear is completely gone you cannot get the same physical look just within one procedure. This surgery was simply to attach the ear to my head the best they could. It required a lot of healing time. Then during a second surgery the surgeon would cut behind the ear and elevate it away from my head. This required another healing process to see what the outcome would look like. Turns out, it just looked like a cauliflower ear that some wrestlers have due to wear and tear from competing in that sport. By this time, I had been wearing a patch over my ear for just under two years. After discovering what the physical outcome was, I ended up going to three different doctors to figure out what I should do. The first and second doctors were to discuss the possibility of reconstructing the ear surgically by removing and using cartilage from one of my ribs. In discussing it with the second doctor he saw that I was wearing a patch over my ear and therefore knew that I was particular about my appearance. This is the point where I was referred to Mr. Greg Gion, MMS, CCA and Ms. Allison Vest. Once visiting Medical Art Prosthetics, I knew this was the route that I wanted to go because of physical appearance. Mr. Gion and Ms. Vest have been very helpful and professional since day one with explaining my options with the prosthetic ear. I was also referred to Dr. Douglas Sinn by Mr. Gion who is one of the best doctors with doing the surgical procedure with the implants for the prosthetic ear. 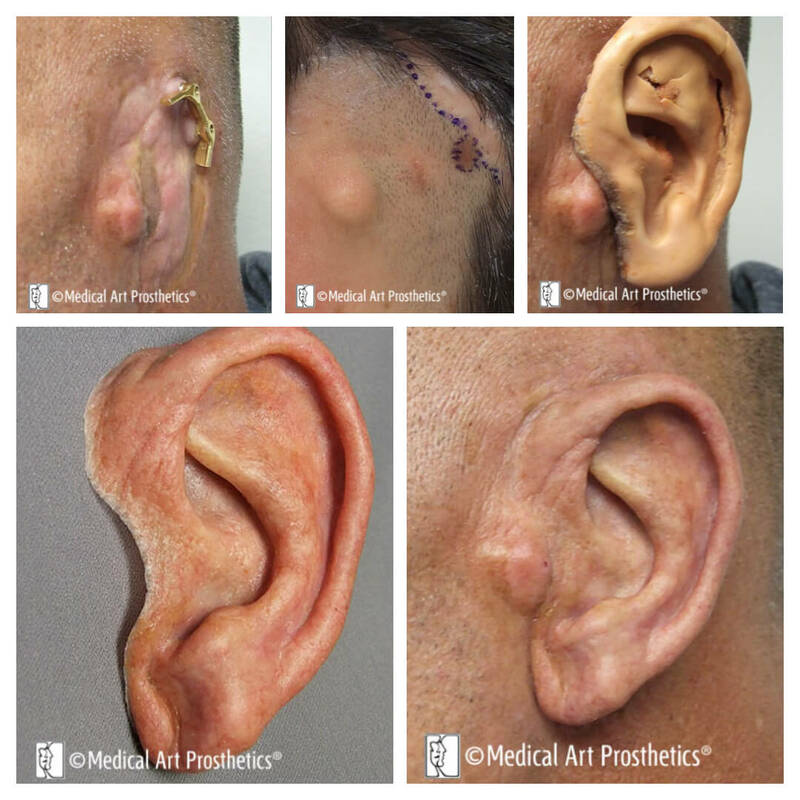 I have been to five doctors from start to finish, but once reaching Medical Art Prosthetics the end result happened quickly. Needless to say, I am very happy and pleased about my physical appearance with the prosthetic ear. 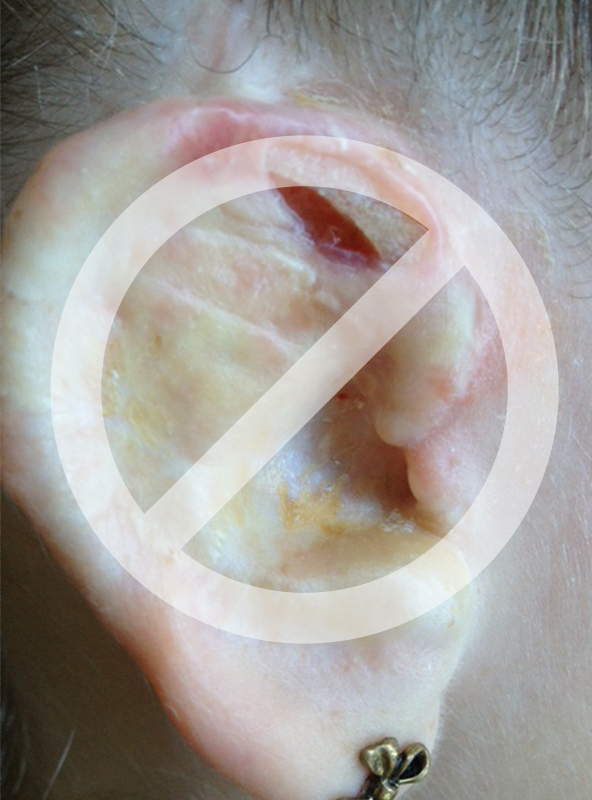 I have had several surgeries to remove a form of skin cancer from the outside of my ear. Eventually it went into the inside of my ear. Since the early nineties, I have had a total of eight surgeries. After several attempts to save my ear it had reached the point that the cancer was taking over and spreading elsewhere. The doctors tried their very best to save my ear, but the cancer kept coming back. Each time it went a little deeper in my ear. In 2007, I returned to the Doctor who had removed by ear. 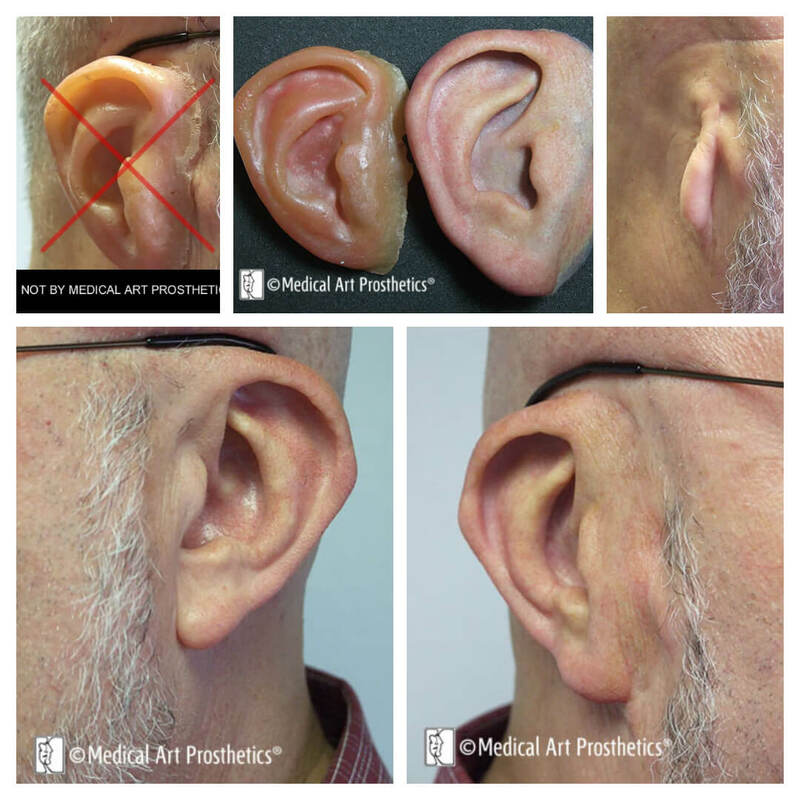 After my wound healed, I was sent to Medical Art Prosthetics where I proceeded to have a new ear reconstructed. Allison did an excellent job matching my prosthetic ear with my real ear. It is an adhesive ear that matches my skin tone. When I do wear it you can not even tell it is a prosthetic ear. My family has even said that it looks like my original ear. The anaplastologists at Medical Art Prosthetics tried to fit me for an ear that would have snapped on. That way I could have just snapped it on and not worried about the adhesive. However, too much bone had been taken out to remove the cancer so this was not an option. We went with the adhesive type which works just fine. I feel confident when I go out with my new ear. I do not worry about anyone starring because my prosthesis matches my other ear just fine. 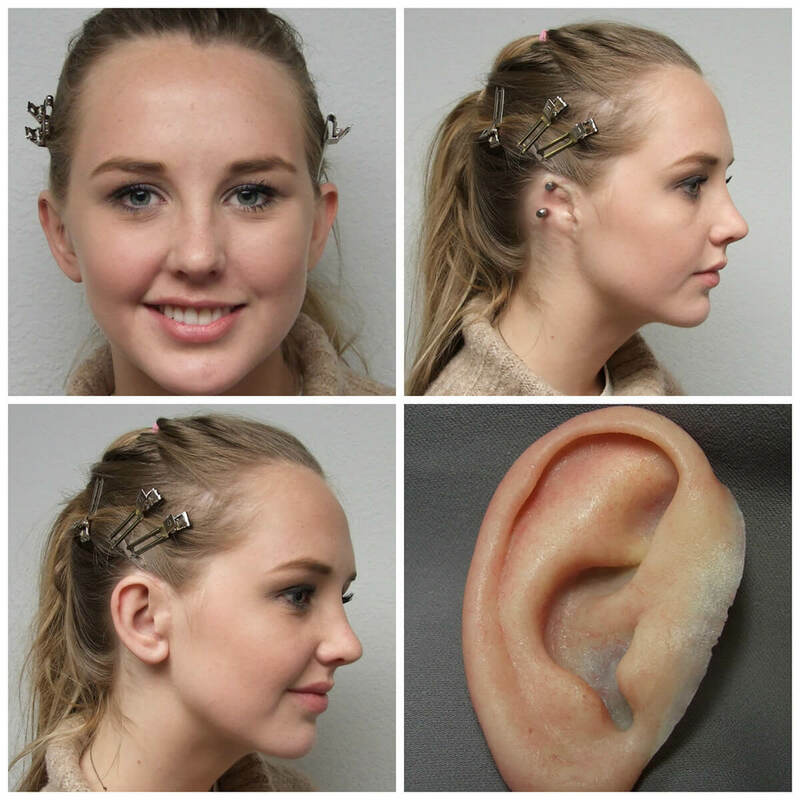 A person that does not know it is a prosthetic ear can not tell. 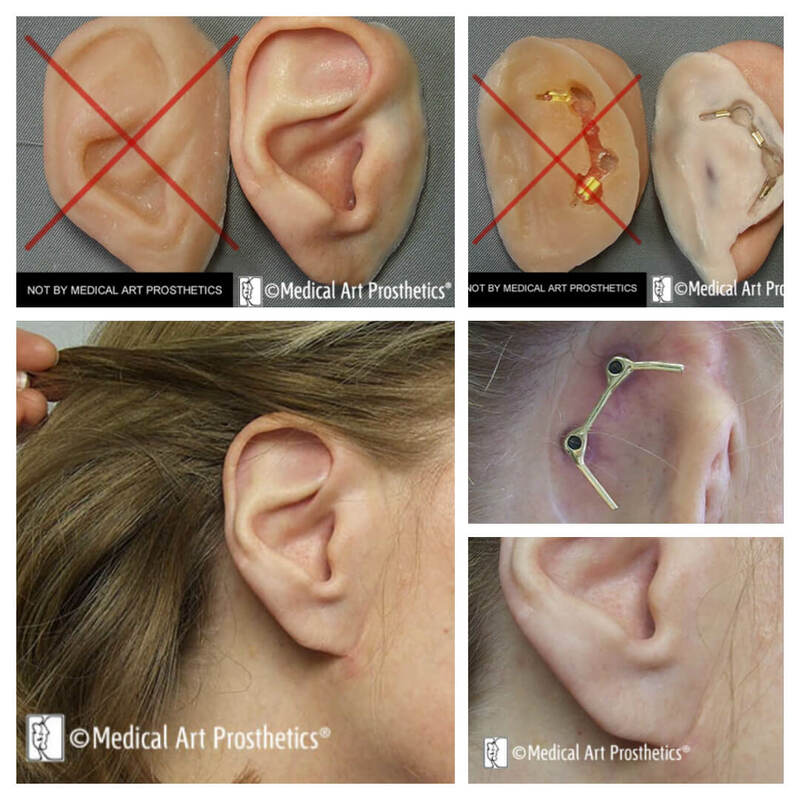 I highly recommend Medical Art Prosthetics. I was treated by a caring group of people that treated me with respect. I will always be grateful for their services. 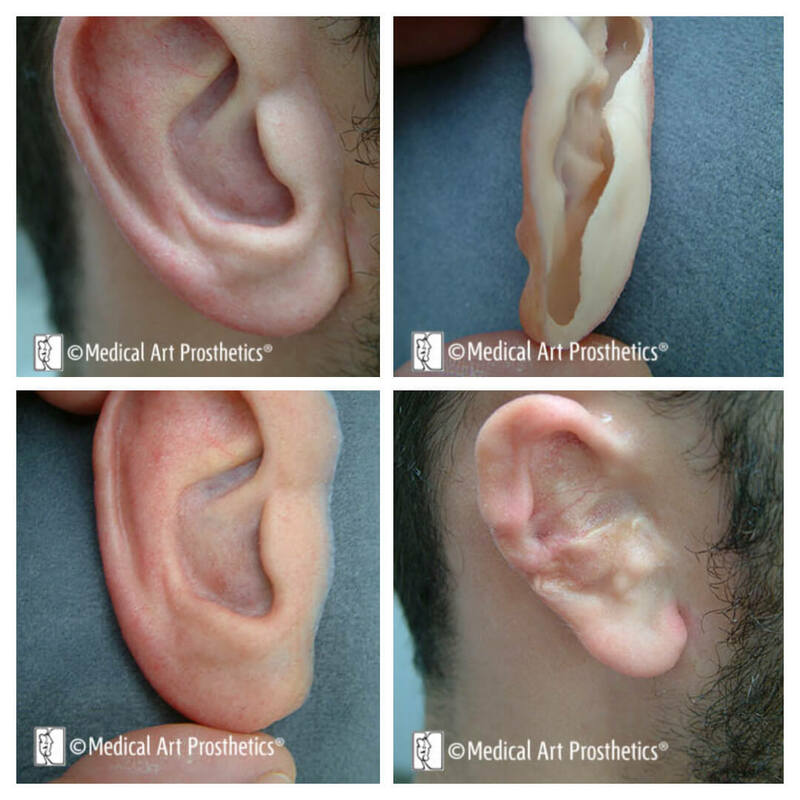 William previously wore an adhesive type ear from another type of prosthetics company. His new craniofacial surgeon, Dr. Matt Conquest, contacted Greg Gion, MMS, CCA for guidance in ordering and placing the implant fixtures in Pennsylvannia thus forming another interstate surgical-prosthetic collaboration. Mason was 6 years old when he first received his bar/clip-retained prosthesis from Medical Art Prosthetics in conjunction with Dr. Sam Marzo. 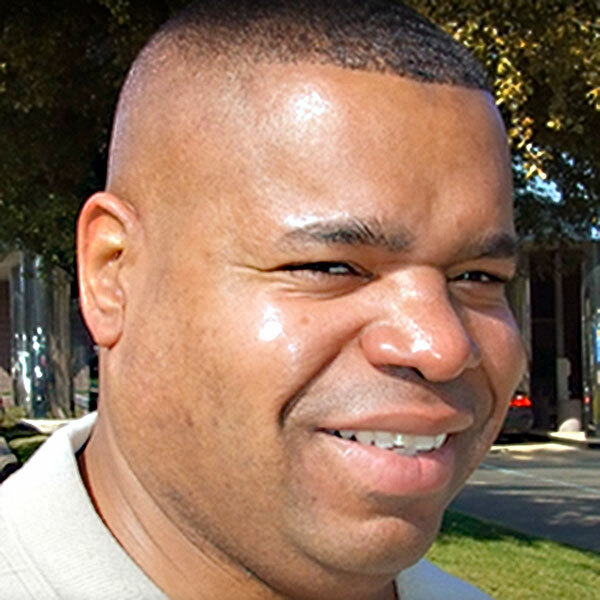 Gabriel has developed a sense of confidence in the materials, techniques and predictable “distance- services” developed by Medical Art Prosthetics. “I’m sorry I haven’t sent pictures of Georgia’s beautiful ear! She left for college just a couple of weeks after we saw you in San Jose….And said she’s happy to be on your website, the ear communities’ or any publication you see fit or helpful to others. If we/she needs to sign a waiver please let us know. 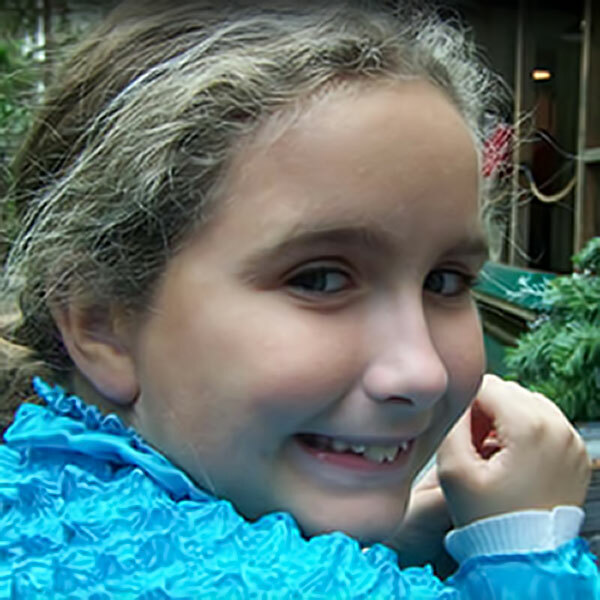 It’s been a huge gift to be free of worry around complications or struggles with her ear. I cannot express our gratitude. Honest. “It’s so nice to know the clips won’t be breaking anymore. I am so very happy with it”. Chris had previously struggled to accept the poor durability and aesthetic result of her bar/clip-retained prosthesis provided elsewhere. 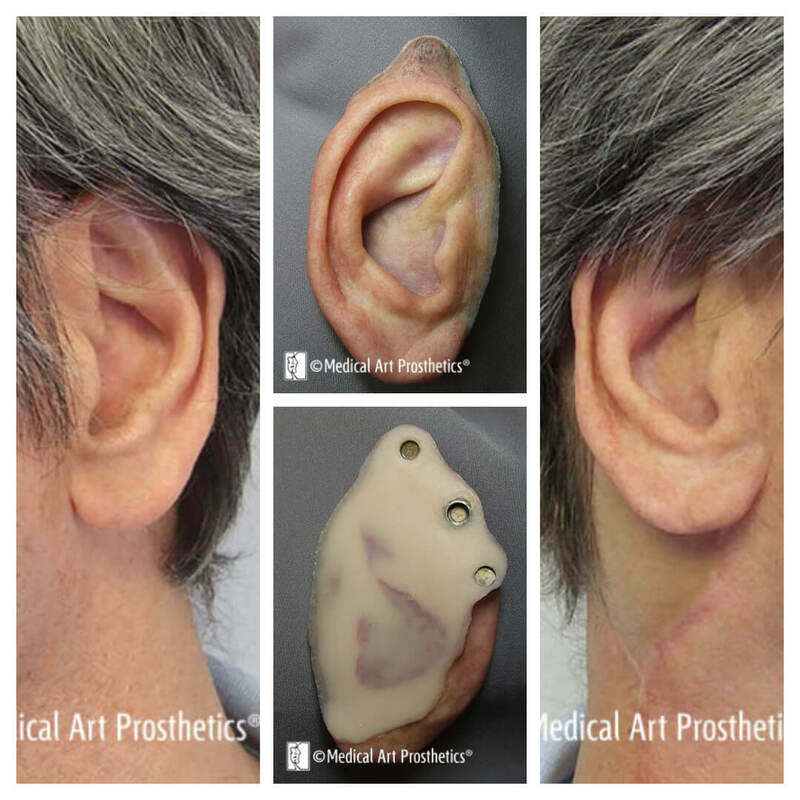 Lynn received an adhesive-retained advanced silicone prosthesis from Medical Art Prosthetics to replace unsatisfactory versions he had received elsewhere for years. 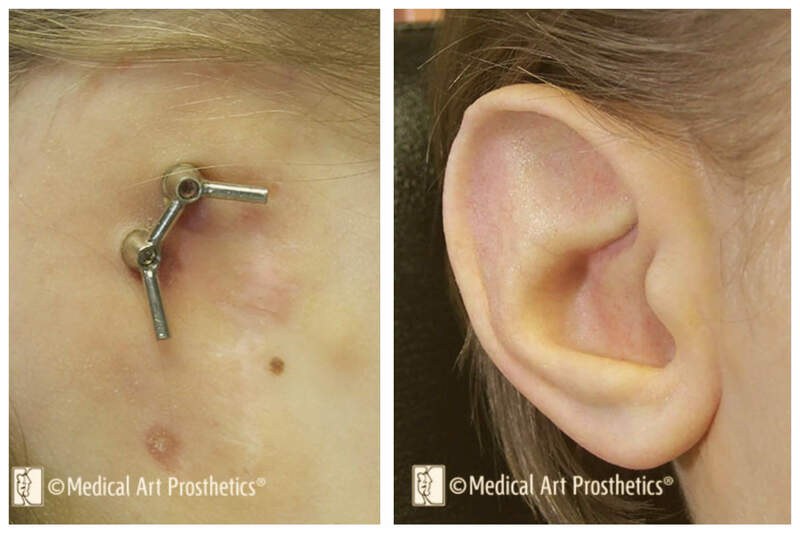 Henry wears an implant-retained ear prosthesis with fixtures placed by Sam Marzo, M.D. of Chicago, Illinois. “People are amazed at the work you have done, and unless someone knows I had lost my ear they would never be able to tell. Even those that do know I have a prosthetic ear cannot tell which one is real”. 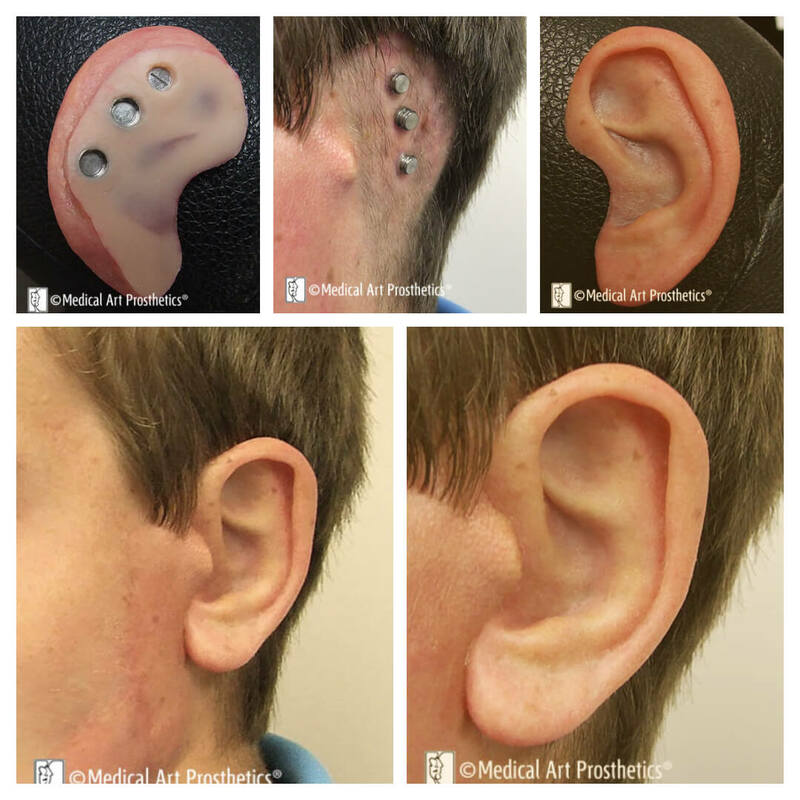 Mike wears a magnetic implant-retained prosthesis created through collaboration between Medical Art Prosthetics and his own surgeon, Dr. Timothy King in Iowa. He also received a “summer-tan” prosthesis. 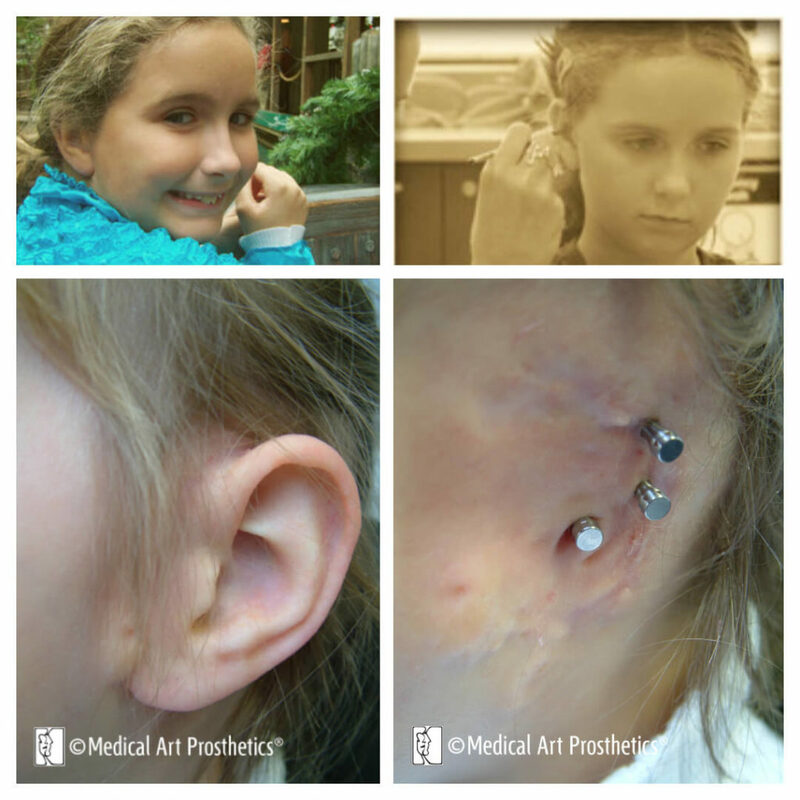 “I just wanted to let you know that my first week with the ear prosthetic has been wonderful! The fit and look is flawless! My morning routine only takes a few minutes, But the real positive result is in the freedom it gives me, I no longer have to be concerned about where I sit in a restaurant, I no longer worry about first impressions meeting new friends and clients. 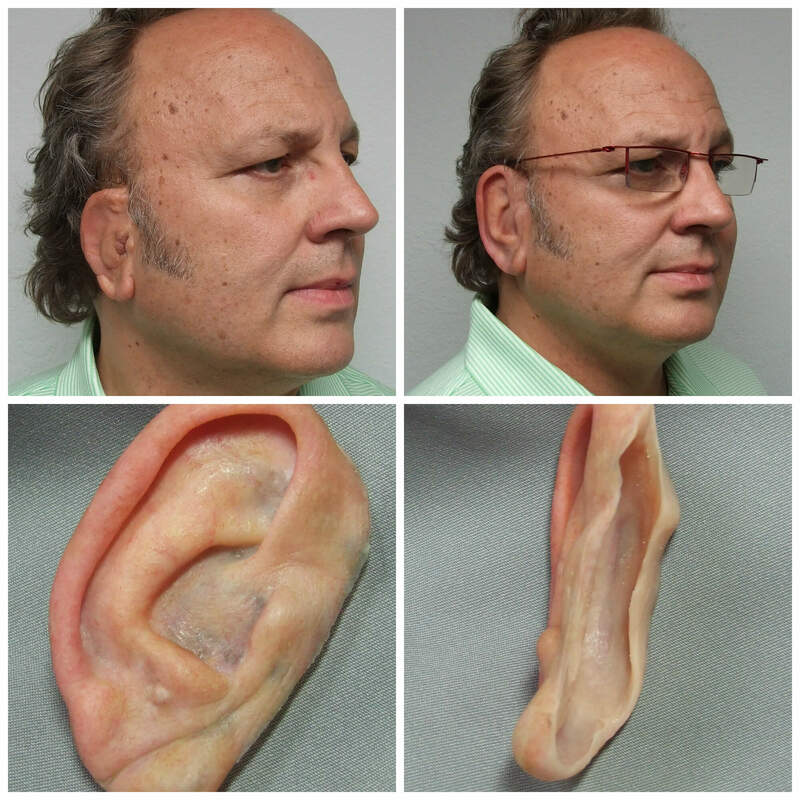 Anthony previously received his ear prostheses from a prosthetics company no longer offering facial prosthetics. 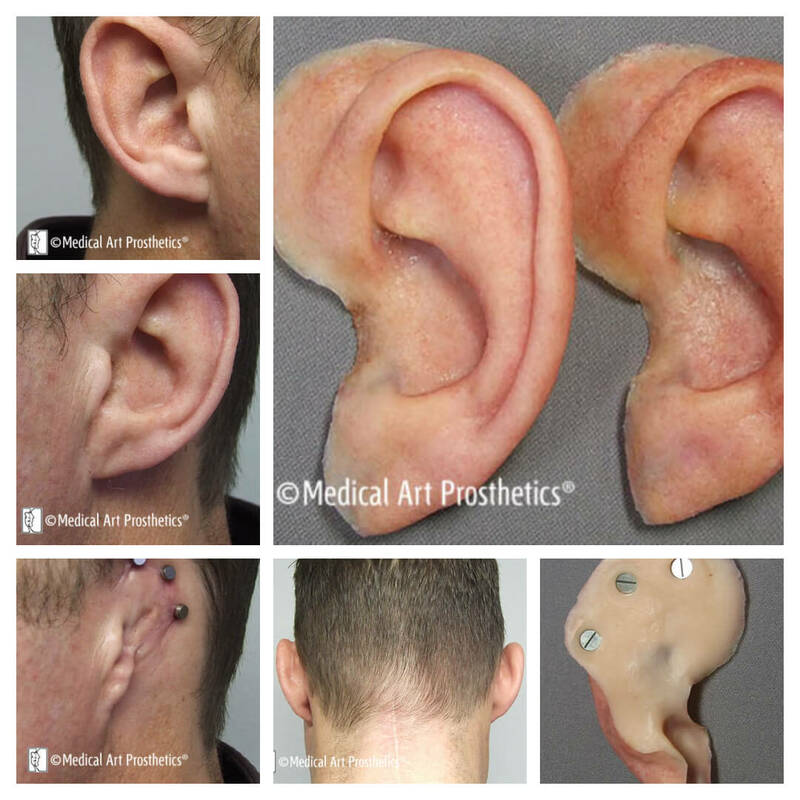 We would love to hear about your ear prothesis from Medical Art Prosthetics.